I've been waiting to use this polish for a while now. I bought two Halloween sets from Different Dimension, one for myself, and one to split up for the giveaway I just had. I'm not really sure why I waited until after the giveaway was over to use one, but I finally did! And it glows in the dark! I've put the photos from in the light and in the dark next to each other for a side-by-side comparison. If you want to view them larger for more detail, click on them! Candied Corn is an amazing polish. It is a yellowish base that glows in the dark. It's made up of mostly orange and white medium hex glitter, but it also has some occasional larger white hexes, and then plenty of fine micro glitter to fill in the rest. 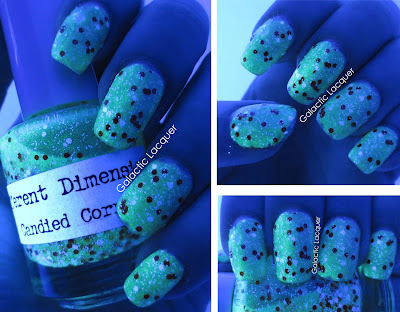 The micro glitter is both white and holographic, so it really catches the light! But clearly this polish is also fun in the dark. I turned out the lights completely for these photos, but my camera still adjusted the contrast to try and make up for it! Still, you can see how it glows a bright greenish sort of color. 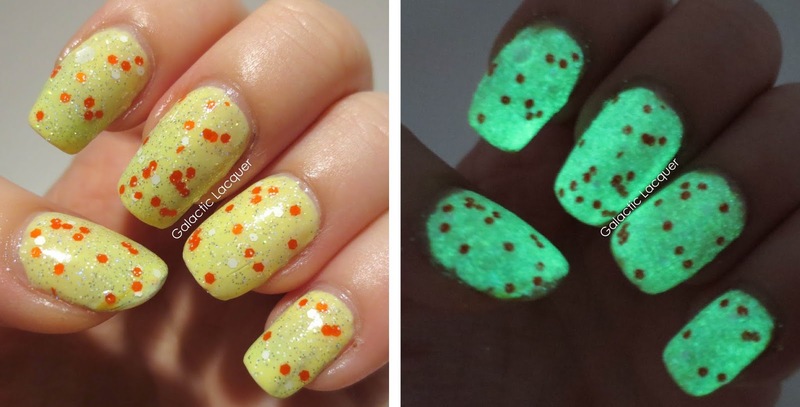 The whole polish base glows, not just glitter pieces! Since Candied Corn is pretty sheer though, I applied it over Revlon's Sunshine Sparkle, which is a light yellow polish. I then applied one coat of Candied Corn. That one coat did the trick! I dabbed it on a little generously, but I like how one coat looks. I didn't want to make it too "busy" with overlapping glitters, also so I could appreciate the "glowiness" of it underneath and in between the glitter. I also took these photos using a black light, or UV light bulb. It glows very brightly, and looks a bit more yellow when it's next to the black light, probably because of the yellow base. It definitely looks bright by one of these lights, but you can appreciate the "glowiness" just in the darkness without a fancy lamp! I love this polish, and I can't wait to use the two others from the set - Ectoplasm and Smashing Pumpkins. 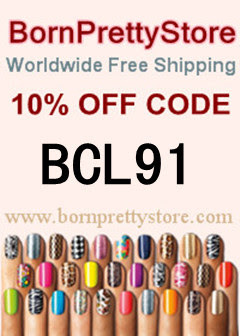 You can check out Different Dimension's Etsy shop to buy some of these polishes. 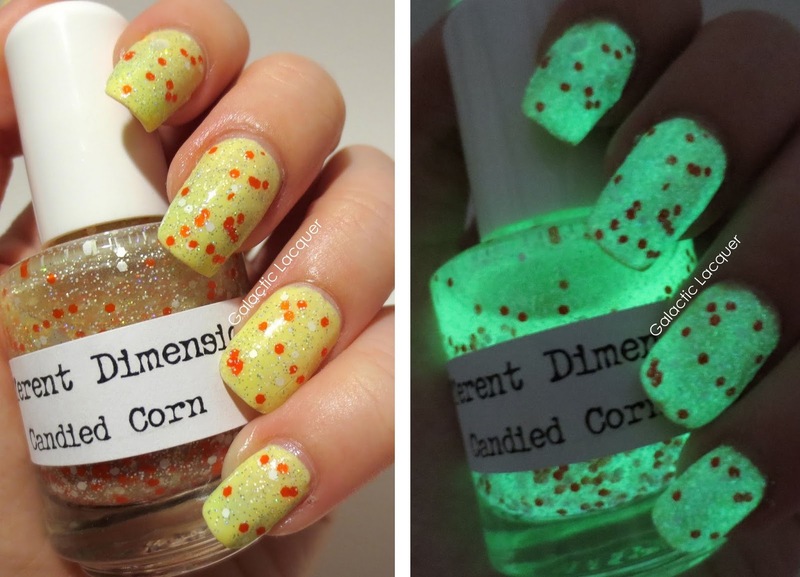 She has more that glow in the dark which sell for $10 each, or other glittery polishes that sell for $8.50. She also has lip balm, cuticle balm, and more!